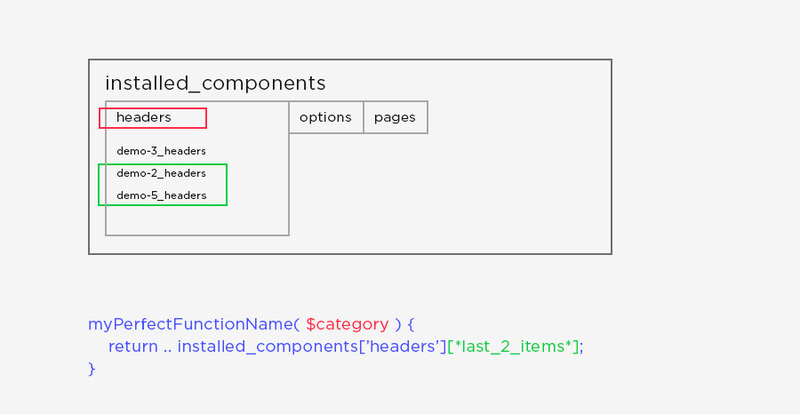 Given the fact that these elements are from the same category but their [each element's] content varies by a lot at times and each of them only holds references that allow me to go deeper in the history chain for other processes, what best should I call these 2 items? Twins doesn't work - they're not the same nor do I want people who use my function to retrieve them to think of them this way; Sisters - same, don't want to denote any kind of intended similiarity of the said components structure / values. Neighbors? $imported_headers will sometimes have upwards of 10 items in it, but this function will precisely only retrieve the latest 2, neighbors would have a kind of finality - supposedly there's no more neighbors if my function is called and it retrieves only these 2 values. My reasoning for asking a seemingly useless question, besides tormenting SE's purists, is that this function is part of 10+ functions that tie my system together and it'll be widely used both by my system and anyone that wants to use my API, it has to be descriptive and clear. Currently my function name is getSisterComponents. It matters a lot that I can have a conversation-like technical explanation about my code with other developers where I don't have to explain each function even if the said developer might not be aware of its implementation. If I call myPerfectFunctionName( 'headers' ); it should return the following array: ['demo-3_headers', 'demo-5_headers'], as such, anyone that sees / uses this function will understand immediately that I'm querying the back-end system to look for the installed components from a category and pull the latest 2 installed items from the said category. I want it to express that the function is a main, important query and that these 2 values are vital to whatever the process that's using the function to retrieve them does. Simply naming it 'getLastTwoInstalledComponentsByCategory` doesn't express usage and is generic. Anything that important should be wrapped in its own class, perhaps called "Context." (In an ideal world, the context would be injected, but that's not relevant to the question at hand). The Context class could expose two members, for example "PrimaryHeader" and "SecondaryHeader" or whatever name is appropriate for your problem domain. I would discourage the use of terms like "Component," "Brother," or "Sister" because those terms are meaninglessly ambiguous to anyone trying to learn your API, and people really do not want to learn any more terminology than absolutely necessary. If they are truly logically unrelated, the primary and secondary headers should be obtainable separately, via separate class members. If there is a performance issue that makes you want to retrieve both at the same time, solve that problem with read-ahead caching (e.g. when the caller requests one, get both and save it for later. Or keep it simple and just populate both in Context's constructor). But don't force the caller to deal with what is really an implementation detail. That is called a leaky abstraction. The last and penultimate (the one before) / the two last / trailing children or siblings. Child and sibling are the conventional notions. What do you call a cron that cksums all your files and writes them to a database? What do you call classes that do arbitrary work in your project? What do you call an iterator that returns the current, previous and next siblings of each node of a list?